Written on April 7, 2014 . Posted in Announcements + Updates, Architecture and Design. Eduardo Benamor Duarte (Assistant Professor, Interior Architecture) will present at the symposium Conversations Across Cultures: Remixing Art Education at Teachers College Columbia University. The symposium will reflect on the critical role of the artist in today’s society, the necessity for new strategies of teaching and learning, including ways to start afresh, un-teach and un-learn, and explore how education can exceed the prevalent brief of skill-training in rapidly changing creative industries and technologically saturated knowledge-societies. What is the role of the artist in today’s society and what is his/her extended role as an educator? What are the issues that higher art education faces today? What does it mean to teach and what do teachers need to learn? How can we develop and implement critical and creative pedagogies meaningfully? In which way can we best nurture teachers, students and collaboration in learning? As collaboration and communities gain increasing importance, how do we break boundaries of institutional teaching? 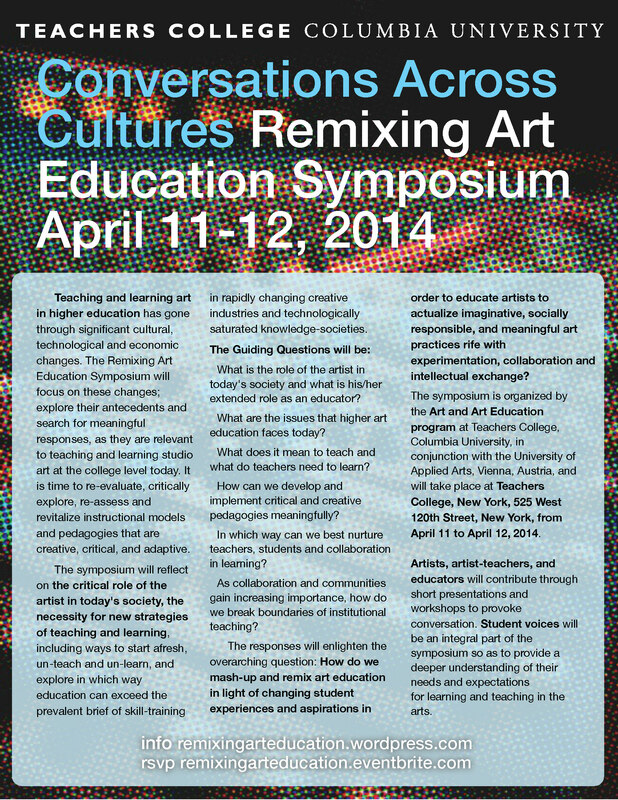 The symposium is organized by the Art and Art Education program at Teachers College, Columbia University, in conjunction with the University of Applied Arts, Vienna, Austria, and will take place at Teachers College, New York, 525 West 120th Street, New York, from April 11 to April 12, 2014. Session 1 · Friday, April 11, 2014, Theme: What does it mean to be an artist in our society? What do students need to learn and know in order to be successful in their artistic lives? ➤Ruth Mateus-Berr, University of Applied Arts, Vienna. Art & Design as Social Fabric. ➤Dorothea Lasky, SoA, Columbia University. Teaching Towards Small ‘c’ Creativity in the Poetry Classroom. ➤Mary Stewart, Florida State University. Bridging The Gap Through Inquiry-Based Teaching & Learning. ➤Eduardo Benamor Duarte, RISD. Reflexive Creativity: Prototyping Environments for a Dialogical Pedagogy in Art and Design. ➤Amy Papaelias, SUNY New Paltz. Design Thinking: Process into Practice in Undergraduate Art Studio. ➤Joyce Yu-Jean Lee, MICA. MFA to Adjunct: Essential or Abject In Today’s Academic Landscape?